Brian Shaw is a four-time winner of The World’s Strongest Man. The world of strongman competitions is one mostly foreign to us here at The Takeout, so I consulted a friend who follows that world; he called him “arguably the greatest American strongman competitor of all time,” and then let loose with a bunch of enthusiastic anecdotes until he said “just tell me when to shut up.” According to BarBend, Shaw is six-foot-eight and weighs somewhere around 415 pounds. To do the strongman things he does, he requires a lot of food; he regularly chronicles his diet on his YouTube channel, including both regular days and “cheat days.” Examples of the latter include this 14,000-calorie Chick-Fil-A meal and this 25,000-calorie day featuring Wendy’s and Krispy Kreme. A video of a shopping trip to Costco has been viewed 1.2 million times. 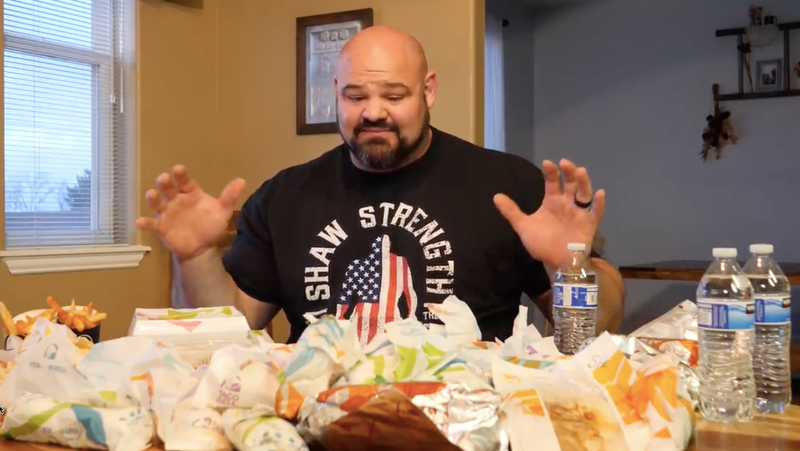 For his latest trick, Shaw ordered everything on the Taco Bell menu, but it did not go well. I encourage you to read BarBend’s account of the affair, or better yet, to watch it yourself, but here’s a quick and dirty account. Shaw ordered each and every item on the menu, some of them more than once (including three caramel apple empanadas). It set him back $120.03. Regret first sets in just before minute 6, after he’s encountered a “chicken something or other, melted”; a “weird sauce” betrays him, and it’s pretty much all downhill from there. He critiques the “worst nachos I’ve ever seen in my life” (note to Mr. Shaw: send them my way) and resignedly tastes at least a little of every burrito he ordered. He “powers through” desserts. But that mystery sauce continues to haunt him. “I don’t highly recommend this, let’s put it that way,” he says. Anyway, if you’d like to watch a guy sweatily and sorrowfully eat his way through “the worst eating challenge that I’ve ever taken part in,” it’s right there waiting for you.